Hair loss can frequently be symptomatic of an underlying medical problem, rather than the result of a hair loss condition. If you are experiencing other symptoms, such as fever, fatigue, or rashes, along with high levels of hair loss, then you should seek medical advice to determine a diagnosis and course of treatment at the earliest possible opportunity. Systemic Lupus Erythematosus (SLE) is a chronic autoimmune disease, which has recently made headlines after singer Lady Gaga received a borderline positive diagnosis. The disease, which is exceptionally rare, affects nine times more women than men and causes the immune system to create antibodies that attack the body’s cells and tissue, including hair follicles. Hair loss through Lupus occurs when the antibodies created by the body infiltrate the hair follicle, causing the hair shaft to be rejected by the body and fall out. Lupus is an inconsistent disease, with sufferers undergoing a constant cycle of flare-ups and remission. Hair may grow back naturally of its own accord during remission periods, although if scarring occurs in affected follicles then the hair loss is permanent. Several advanced hair replacement methods are available to sufferers of SLE, helping to offset the worst of the symptoms. Other symptoms to look out for include a butterfly-like rash across the nose and cheeks, ulcers in body orifices and joint pain. Although there is currently no known cure, SLE is rarely fatal with modern medicine; however, it can seriously impair quality of life. Crohn’s disease is a severe inflammation of the gastrointestinal tract. Similar to Lupus, it can’t be cured, but can be brought under control, entering into a cycle of flare-ups and remissions, so sufferers can still enjoy a good quality of life. It is very rarely fatal and affects men and women almost equally. Crohn’s, and other inflammatory bowel diseases, such as ulcerative colitis, can cause hair loss as they limit the absorption of essential nutrients through the gut. In a healthy human, many nutrients and vitamins are absorbed through the wall of the gut into the bloodstream, to be delivered around the body. Any form of inflammatory bowel disease prevents this absorption, resulting in a nutritional deficiency which can cause hair follicles to cease their regeneration processes and begin shedding. Hair loss caused by an inflammatory bowel disease will usually grow back of its own accord once the illness itself goes into remission. Other symptoms of Crohn’s disease include severe abdominal pain and extreme weight loss. Thyroid Disease can refer to either an over-active thyroid (hyper-thyroidism), or an under-active one (hypo-thyroidism). Both conditions can cause hair thinning. The thyroid is a gland found in the neck, responsible for creating and releasing hormones throughout the body. Hormones are a major trigger in hair loss conditions and a thyroid condition will have a direct impact on hormone levels within the body. Consequently, hair loss is a frequent symptom of a thyroid condition as the changing levels of hormones in the body impact on the hair follicles’ natural cycle. 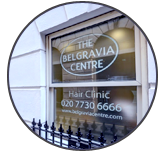 If you have experienced hair loss as a side effect of any of these conditions, contact the Belgravia Centre to discuss potential hair loss treatments which may help you recover your lost locks, or complete an online diagnosis form. If you are concerned about any of the illnesses described above, contact a doctor for professional medical guidance.